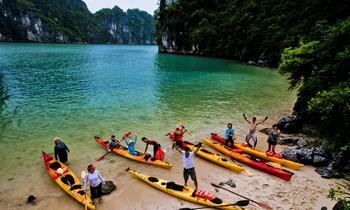 Halong Bay is a famous and wonderful destination for traveling in Vietnam. Therefore, there are a lot of tourists spending time traveling to a wonderful destination. 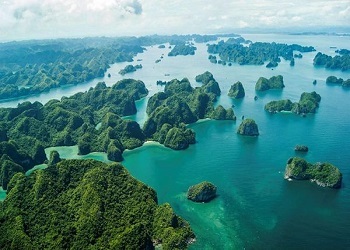 It is the reason why the post will introduce how far from Hanoi to Halong Bay. 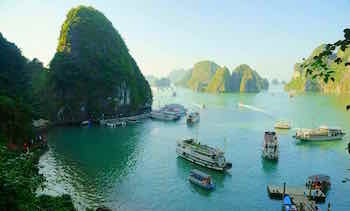 Halong is one of the famous beautiful bays annually attracting millions of domestic and foreign tourists to travel here. Halong has a length of 50 km and far 165 km from Hanoi to the northwest as well as Hai Phong 60 km to the West. Furthermore, Halong Bay is also far from Mong Cai border gate 184 km to the East, the South to the South China Sea. 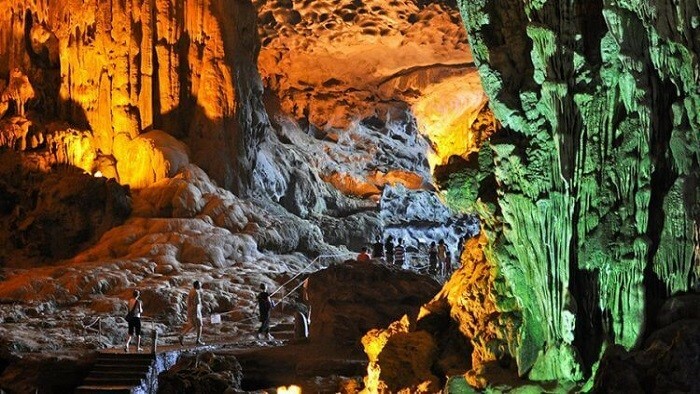 Besides that, possessing a diverse and complex topography including hills, valleys, coastal areas and islands, Halong is one of the oldest historical formations in Vietnam. With the values of geology, culture, and history, it has created an attractive destination with valuable attractions. 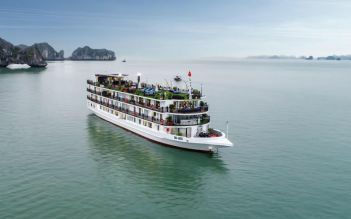 In fact, tourists can spend time traveling Halong Bay all time of the year but summer is considered as the best time for traveling. 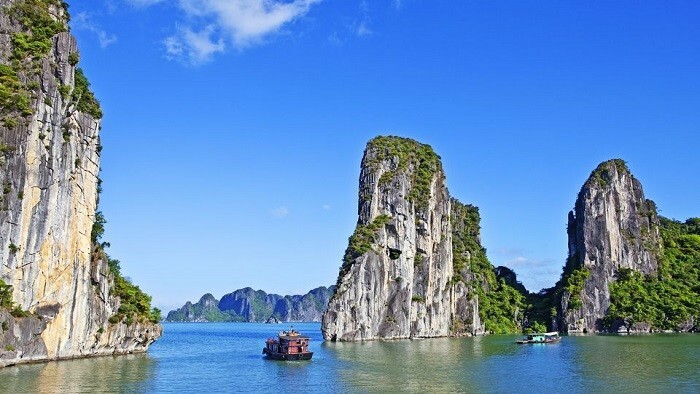 Halong Bay is known as the most attractive destination in Vietnam, so there are a lot of tourists choosing the place for traveling especially summer. It is the reason why currently, transportation routes to Halong have formed a quite complete and upgraded network; completed the project of upgrading and upgrading National Road 18, National Road 10, and National Road 183. Furthermore, the urban road system has also been invested and upgraded, including the sidewalk and drainage system. The density of main roads reaches 5.6km/km2. The means of traveling between tourist sites is a problem that tourists always face many difficulties. Therefore, the development of technology has contributed to solving this problem. It offers a lot of choices to meet the needs of all travelers. 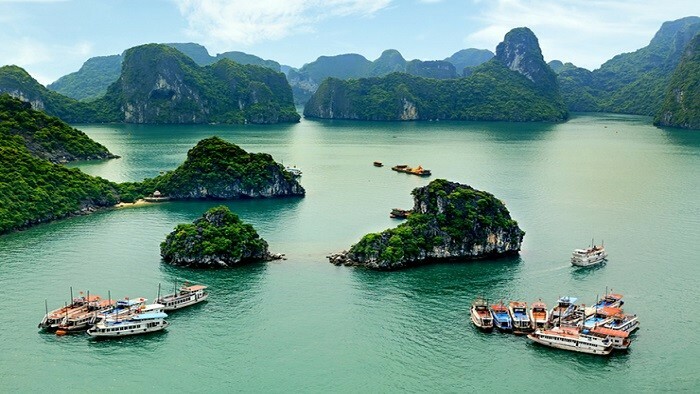 In Vietnam, one of the most popular tourist routes is Hanoi - Halong. Hanoi is the only big city located near Halong Bay. Therefore, it is very convenient for you to distribute time and balance in the most appropriate way. You can also take advantage of the distance to enjoy a short day trip. 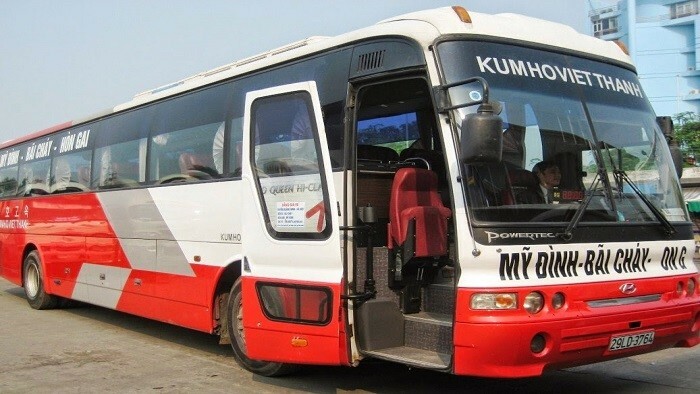 The cheapest way to transfer from Hanoi to Halong is the public bus. Like anywhere in the world, the public bus is a cheap way of transportation. This option allows you to learn more about the daily life of Vietnamese people. However, like Vietnamese public transport, a public car has many disadvantages. This makes foreign visitors seldom choose. However, if you want to have different experiences, you can catch a bus from Luong Yen bus station, My Dinh bus station or Gia Lam bus station to Bai Chay bus station in Halong City with price from 100.000VND- 130.000VND during 4 hours for transferring. Besides the disadvantages, traveling by public bus will help tourists understanding more about local culture and new experiences way. However, for travelers who only have a day's time, this is not the best option. 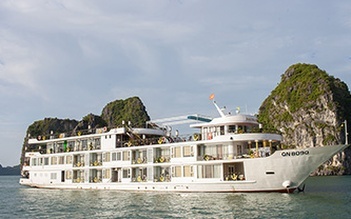 Due to leaving Halong Bay soon to move, your journey will not be complete. For travelers who have a comfortable time schedule, there is nothing to be confused about when choosing this culturally rich means of transportation. If you don’t want to travel by public bus and still want to save money, bus express is the best choice for you. These buses are owned by travel companies. They focus on meeting the needs of foreign guests. Almost bus expresses start from Hanoi Old Quarter. Therefore, tourists can easily catch a taxi to the focus point. There is also a high-quality passenger car company like Hoang Long Expres. Vehicles arranged a lot of car routes departing during the day. Every 15 minutes, depart from Kim Ma bus station on Nguyen Thai Hoc Street. This way makes traveling easier for small group travelers. However, the time for you to travel from Hanoi to Halong is like a bus. It takes about 4 hours for this trip. If your vacation lasts a few days, passenger cars are an economical and flexible option. However, if you only have one day, make sure you depart before 8 am. 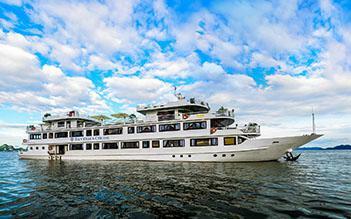 This ensures you have enough time to admire Halong before returning to Hanoi. Although motorbike is not an idea to choose most of the tourists when visiting Halong Bay, it is an amazing and new experience for anyone who wants to enjoy a strong feeling. Similar to cars or buses, moving from Hanoi to Halong will take more than 4 hours and can make visitors tired during the journey. Therefore, if you do not have experiences for transferring before, traveling by motorbike is perhaps danger way. It is the reason why you should understand the way for transferring carefully before joining the traveling way. Private car is known as the easiest way to transfer from Hanoi to Halong Bay. This is the choice for families with lots of luggage, a group of friends who want to sit comfortably chatting with each other without worrying about affecting the surrounding or those who are on business and want to focus on work all the way. 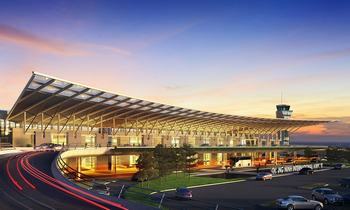 Most hotels offer shuttle services by car and services include car rental to the airport. There are a lot of agencies willing to help tourists in the transfer. Therefore, if you want to save money and time, you should contact a reputable travel agent who will help you solve all things. For those who are more adventurous and independent, you can rent a car and experience the scenery of Vietnam yourself. The price of renting a car falls to VND 1,500,000 - VND 2,200,000. This is another public vehicle used more by the people in the country. Trains give passengers the opportunity to see the beautiful scenery on both sides of the road. However, the train from Hanoi to Halong will last 7 hours. This is usually not an appropriate choice for travelers. From the train station, visitors will take extra time and cost to catch the bus to the city center. 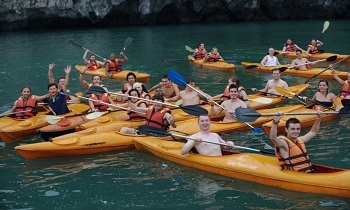 In addition, you will have to wake up early if you want to enjoy a full day in Halong. Besides, you should also note: the pier is about 5km from the station. So make sure you arrive on time. Although the train also provides 2 choices for tourists including soft seats and hard seats with different prices, train to Halong only has hard seat because the train is designed to serve local people. Furthermore, thanks to that it is good opportunities which can help tourists understand more about the life of local people. Therefore, if you want to travel with the way, you should visit the main website of the Vietnam Railway to know exactly the train’s itinerary. It is considered as the most expensive way to transfer from Hanoi to Halong, but the helicopter is also the fastest way. Another quite adventurous vehicle that travelers can use to travel from Hanoi to Halong is a helicopter. Quick and suspense is the feeling of visitors sitting 45 minutes on the helicopter and watching the landscape of Halong below. The flight departs from Gia Lam airport which is a small military-owned airport. Helicopters have a capacity of 7 people including pilots and passengers. So it is only suitable for small groups of tourists. 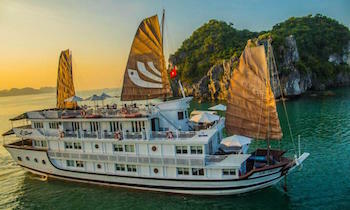 Many companies incorporate this service into a tour so that passengers travel to Halong Bay or return to Hanoi at a lower price than renting a private helicopter for thousands of dollars. Although it is a high-cost service, passengers traveling by helicopter can still face potential dangers. This will definitely be a great option if you can afford financial talent but at the current price, helicopters are not the choice of many tourists. If you are looking for the most luxurious way of transferring from Hanoi to Halong, you don’t forget to enjoy seaplane. 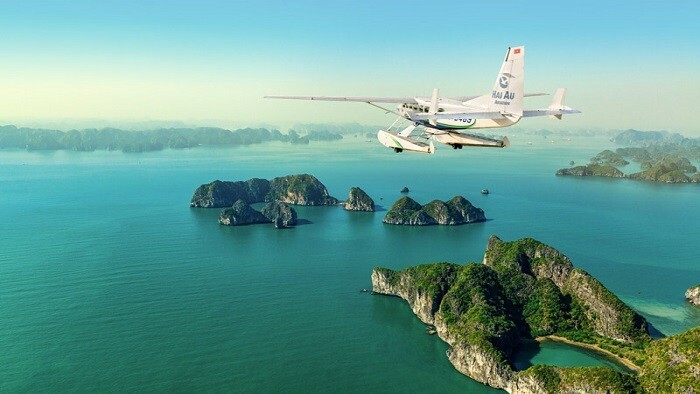 Hai Au Airlines is proud to be the only unit providing sightseeing services with seaplanes from Hanoi to Halong Bay. Like helicopters, the journey with the seaplane lasts 45 minutes, so it is a good way to save time. 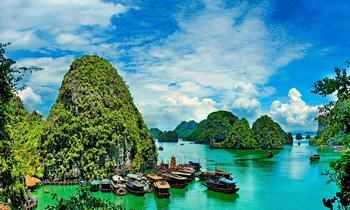 Therefore, you can enjoy the beauty of Halong more than other means. Although the way is more expensive than other forms of ground travel, the cost of a flight with a seaplane is much lower than a helicopter and not too high compared to renting a car. Hope that after the post, tourists will have the useful and necessary information for traveling to Halong Bay.